At Amore Bakery we usually specialise in cupcakes, but we recently discovered how much we enjoyed making branded doughnuts. We only use the best quality ingredients to ensure they come out beautifully every time. These 1000 doughnuts come with white buttercream and a sugar disc printed with your logo. However, we do have a whole range of doughnut options if you are looking for something more bespoke. 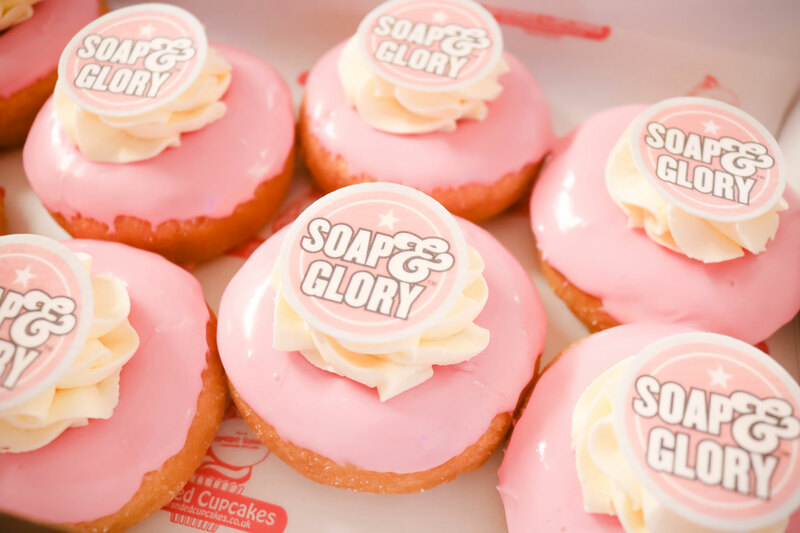 Check out these beautiful pink branded doughnuts we created for Soap & Glory. 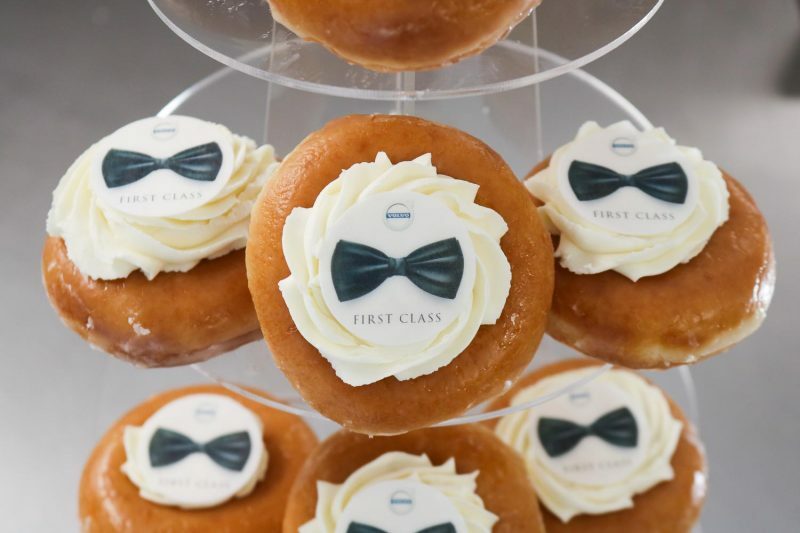 Our personalised doughnuts are perfect for any occasions, from sending to potential clients, weddings or showing your staff that you appreciate everything you’ve done for them. We recently created 1400 doughnuts for Utility Warehouse when they won their Which? Award to show all their staff members how proud they were. All of our doughnuts are produced in our wholesale bakery, using state of the art equipment, so we produce thousands of baked good every day. We hand-deliver each order of personalised doughnuts, in our electric cars, so that each order arrives in perfect condition, but also so we reduce our impact on the environment. A 7-day notice is required for any online orders, but if you need them sooner, give us a call on 01525 83996. If you want to really wow your potential customers, we love to create something a little different. We have a whole range of icing colours, flavours and designs so that your branded doughnuts perfectly represent your company. 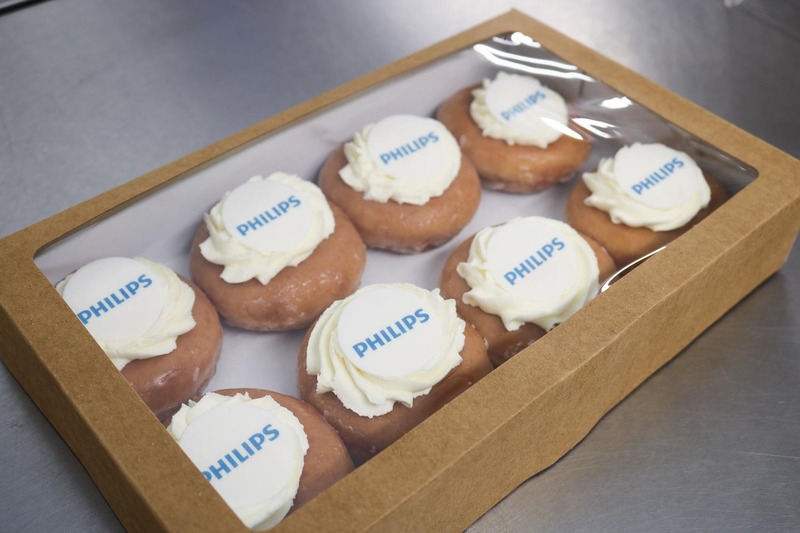 Plus, we can produce anywhere between 10 to 100,000 personalised doughnuts for you. So, no matter if you need something small or large each one is hand made to the same high standards. Need them in different locations? We hand-deliver all our orders, so can deliver them to multiple locations all on the same day. We recently completed an order for 7,000 cupcakes in 39 locations all delivered before midday, so whatever you need, we can ensure it’s done.